To use the model P438USA, connect the two terminals in series with a load circuit that draws between ten milliamperes and three amperes. Connect to any voltage between 24 and 240 volts either AC or DC, set the 10 DIP switches to the required delay, and apply operating voltage. When the operating voltage is applied, a small amount of current will flow through the load and the timer. At the end of the delay period, the model P438USA turns ON and full load current is permitted to flow. 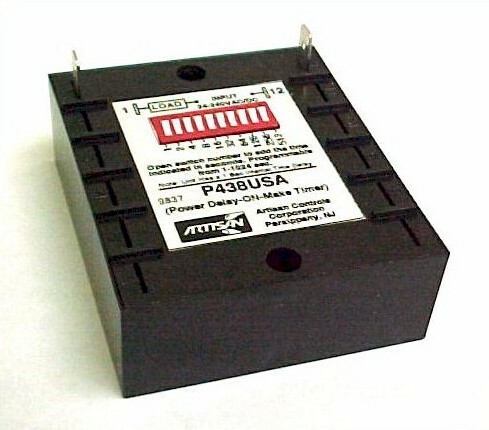 Operating Voltage 24-240V AC or DC, non-polarized input. Output 10 milliamperes to 3 ampere inductive. Inrush to 25 amperes for 8 milliseconds. Timing Range 1-1024 and 2-2024 Seconds. Timing Repeatability +/- 1% Nominal.